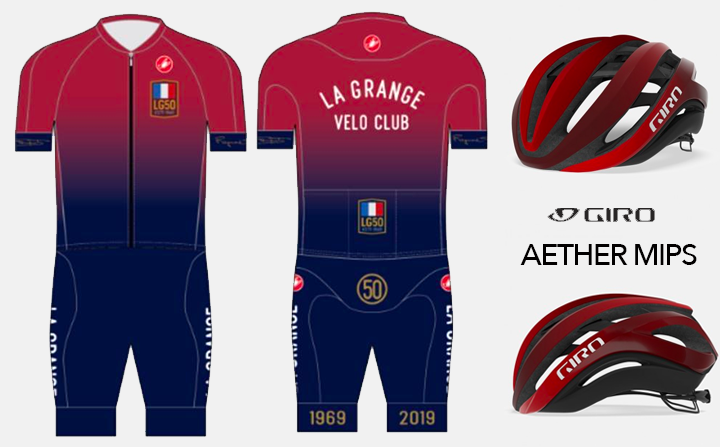 Thanks to the relentless work and dedication of Joseph Duerr, Velo Club La Grange will be the very first cycling club to negotiate a cycling race on a 53 acre CLOSED course race track at the Porsche Experience Center in Southern California! For those of you that do not know about this race track, it is a location where Porsche USA allows owners and guests to race around this enthusiasts play-land https://www.porschedriving.com/porsche-experience-center-los-angeles. The La Grange Grand Prix will offer an extraordinary bike racing experience. Several club members have had a chance to ride this course, and it is spectacular. 1.4 miles of straights, turns, hills, and descents on an immaculate high-speed unblemished tarmac. When you ride on it, you will know that with every turn of your crank it will test everything you’ve got. This race is incredibly unique and will not be missed. Sunday, June 2, 2019, is the date. Keep it free and get ready to race or just attend to watch your fellow members and friends race this spectacular course. Plus, all Juniors will race for free, so we want to see you all out there! 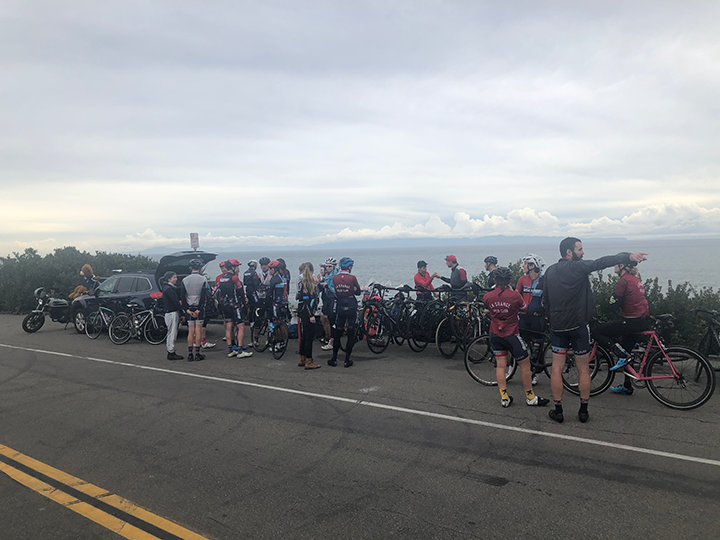 The March 50 for 50 ride route was changed the day before the ride due to the closure of Topanga Canyon for hillside damage repair. The turnout was awesome. The route went south to Marina Del Rey, east on the Ballona Creek bikepath, north through Beverlywood and into Beverly Hills via Rodeo Drive with a stop at the Witch’s House, then into Franklin Canyon with SAG provided by Jan Datomi, down into the valley to the Orange Line bike path then up and over Sepulveda and into Santa Monica for lunch at Tacos Por Favor. We hope you join us for the April 50 for 50 ride! The start of the ride at SVO. The Mastermind behind the 50 for 50 rides, Jaycee Cary. The Queen of SAG…Jan Datomi. Thank you Jan! Riding on the Ballona Creek bike path. Photo by Leo…who else?! The iconic Witch’s House in Beverly Hills. SAG by Jan Datomi at Franklin Canyon Lake. The 50 mile mark at Tacos Por Favor. Save the date! Sunday, July 14th, which is Bastille Day, the City of Los Angeles will present the club with a proclamation recognizing the club’s 50th anniversary at the start of the World Famous Nichols Ride. We expect a huge turnout for this so be sure to mark it on your calendar now. This year, as part of its commitment to developing track racers and as the club with one of the largest contingents of track racers in LA, La Grange sponsored a set of race-focused women's track clinics earlier this year. The first clinic on January 26 introduced racers to basic concepts of racing on the track and the different types endurance races. The second clinic, held over two days on March 9-10, was geared toward intermediate racers with a focus on skills an tactics for the four events of the International Omnium. The clinics were taught by Chris Birch, a two-time US Elite National Champion and member of the US National Team. A couple weekends ago I participated in the LAVRA Women’s Race Clinic on Intermediate Mass Start Racing on the Track. I was hesitant to register as the event was advertised for Intermediate track racers, and I’d only ridden on a velodrome three times before, but eventually Zach LaBry, who organized the event, set me up with one of the track’s rental bikes and coaxed me into it. A mix of women showed up for the clinic – masters racers who had earned stripes on their kits, women who’d been racing track for a few years, women who had ridden on velodromes for years but had never raced, and a few women who – like me – had only been on a track a handful of times. The clinic consisted of two 3.5 hour sessions lead by Chris Birch and Zach LaBry. Over the weekend we covered all four international omnium events – tempo and elimination on day 1, followed by scratch and points on day 2. We talked about tactics as Chris drew diagrams on a whiteboard, then we’d break into drills for attacking, moving around the pack, and defending position that were tailored for the specific situations we’d discussed, but applicable to any mass-start track race. Everyone at the clinic was extremely supportive. Chris and Zach did a phenomenal job of making sure everyone was getting something out of the drills – not an easy task with that spread of experience levels. The racers who had spent a lot of time on the velodrome were helpful and respectful of those of us who were brand new, encouraging us and making us feel welcome to share the boards with them. The clinic culminated in a mock omnium in which we raced shortened versions of all four events with a quick rest and debrief after each. Again, I was hesitant to participate in the mock races, fearing that I’d inadvertently get in the way of the more experienced racers, but they insisted that wouldn’t be the case. It was a huge mental hurdle for me to race in close proximity to other people on a bike with no brakes, but knowing that all the other racers wanted me there helped me get over it and boy, was it fun! While I can’t say I did particularly well in any of the mock races, I got a glimpse of what it would be like to actually race track – blistering speeds, people on all sides of you, and –of course – a lot of left turns. Over the course of the clinic, I faced fears, made friends, learned a ton, and got in a workout. What a way to spend a weekend! Next up for me: buy a track bike and sign myself up for a race! Katy Olesnavage (right) attended both intro and intermediate track clinics that were coached by Chris Birch (second from left) with help from Zach LaBry (left). This year 18 members of the race team traveled to the Tour of Murrieta. Held the weekend before Redlands, this race gives amateurs the chance the rub elbows (sometimes literally) with pro riders who are just warming up their legs. As a cat 3, I had the chance to race hard in the women's 3-4-5 crit and then start again shortly after with the pros. With the Mexican national team, a pro canadian team, and numerous others it was an unprecedented chance to see how it's really done. Spoiler: it's done FAST. After that crit, Daniela Garcia reports: "The Mexican team was leading the overall and I knew they will control the [circuit] race. I was covering the brakes because Liz was on the overall. It was a hard race.. I suffered bad cramps on the last lap but was still able to get 7th on the stage." Her teammate Liz Ureno took 8th overall in the women's P12. As for the men, Duncan Clark returned to take first place in the 2/3 omnium for the second year running! Patrick Barrett and Victor Ayala, each racing in different categories, raced super hard in the circuit race. "I broke rule #1 of being in a break," says Victor with a huge grin. "Don’t get dropped from the break." As Patrick's breakaway - it's all on video. After many laps of gaining reputation by attacking the leaders ("two Dutch brothers"), he sees the winning break and bridges up. By the time the break passes Ft. La Grange he's on the back of the break with his tongue hanging all the way out. Then on the back stretch he blows up. It's races like these that help riders grow their skills. Acacia Shyr writes: "A highlight was watching the amazing talent in the other races! I realized that I could have pedaled through many more of the corners than I did while I was watching the other races. I think this skill comes with lots of practice." Acacia also describes working together with teammates Emily Conant and Ellie Perry, who passed her a gel when the going got tough. Emily is new to the team, and agrees on the importance of bike handling. " I slowed myself down a lot at the turns and had to expend a lot of extra energy catching up." Another tip from Kim Kopenhaver: "It's important a few laps to go start moving up. I had the strength at the end but hesitated too long and the window to move up closes very quickly!" Having your teammates around is the best part of a travel race weekend, especially for all the new racers. "Unfortunately for my legs, I could not disappoint LG’s cheer-leading squad, let alone let down my teammates. So I stuck through." "The atmosphere and camaraderie was motivating!" says Liz Fu. In the W345 circuit, "I even managed a little (accidental) breakaway! In fairness Dani was shouting “go go go”, so who am I to ignore instructions?" Race Day Boss Ellie Perry, who booked the house and shopped for food, has maybe the greatest racing lesson of all: "Racing isn't only fun if you do well in the race - if nothing else it's just fun to ride your bike somewhere different and spend quality time with some of the best people around!" Victor rocking the #LG50 kit. Lizbeth Ureno on the line. Baking cookies at the La Grange house. Needless to say, February was a busy month for La Grange. Read all about what happened and what is happening below. Marco Fantone led the February 50 for 50 ride to Griffith Park. The ride started at Peet's Coffee in Westwood Village. It proceed up Sepulveda to the Skirball Center to Mulholland Drive, down Barham and onto the Griffith Park Observatory with a well earned lunch at Tacos Por Favor in Santa Monica. Look for an announcement for the March 50 for 50 ride soon! Thanks to Jan Datomi for providing much needed SAG. The annual Helen’s Night was extremely well attended. Did you know that Helen’s calls it La Grange Night? Food was served from Pitfire Pizza and, as usual, there wasn’t much food left over at the end of the night. Thank you to Jay Wolff and the entire Helen’s team for working late and making the night so special. If somehow you missed it, our 50th anniversary LG50 kit is now available to “wear” in-game on Zwift! Check out this amazing LG50 Zwift video on Vimeo! · Pre-Zwift, I hated riding indoors. HATED it. I would literally stare at the workout timer and count down the seconds. Slowly. Excruciatingly… slow. With Zwift’s gamification of the indoor riding experience, I actually enjoy riding indoors. I don’t plan on giving up riding outdoors anytime soon, but I find Zwift a nice complement to the outdoor riding we all grew up with. · Zwift, or any indoor riding for that matter, it ultra-efficient. No stopping and with today’s smart trainers, you can nail intervals with clinical efficiency. If you are not on Zwift already, you can sign up and demo FREE (no credit card required) at zwift.com and if you need a smart trainer, head over to Helen’s Cycles. Their Santa Monica location even has two trainers set up with Zwift running at all times, so you can check it out for yourself! If you are a current member in good standing and want access to the LG50 kit on Zwift, please email racedirector@lagrange.org and we’ll get you set up! Thanks to Zwift and Rahsaan Bahati for bringing our 50th anniversary kit to the world of Zwift. See you on the (virtual) roads! Armenia is a former Soviet republic in the mountainous Caucasus region between Asia and Europe with around three million people. Coming out of the Soviet breakup, a devastating earthquake, and striving for democracy, money is extremely tight especially for recreational sports like cycling. The country is very mountainous, which makes it ideal for hiking and mountain biking. A few years back the Asana team was training in the mountains of Armenia near the Lake Sevan area. I started biking there in 2012 with a charity organization called Bike for Hope. In 2013, we invited the local youth cycling club to join our annual charity tour (6 days) around the countryside. The youth cycling club kids range in age from 11 to 22 years old. There are two main cycling clubs in Armenia with about 70 members each and then various cyclists in the village towns around the country. There are also a few masters clubs plus a TriClub. They have very little money for sports so any donations are greatly appreciated – especially for the kids. Most are fairly poor and appreciative of whatever we can gather. One time one of the boys had a flat and I helped him fix his tire and was amazed when he pulled off his tube and it had over 12 patches on it! It is also quite common to see riders with duck tape holding up their helmets and shoes. A few of the boys from the youth team have made it all the way to some Italian pro minor teams. They also compete in the European, Russian, and Iranian cycling competitions. Below are some photos of the youth team. Again, all clothing is greatly appreciated and will be distributed and used. Thank you to Jaycee Cary for coordinating these donations. "Jeff it's me. It's Sunday the 24th. I'm in Carson. I have the song Mr. Blue Sky stuck in my head by..." Oh gosh I should say ELO but it's actually the new Weezer cover album I've been listening to on repeat. "...ELO." Phew. I'm a liar but at least the race director knows I'm coherent. My assailant looks distraught, ashamed, and guilty, which is enough for me to wrap him up in a hug, letting him also know I'm OK. His SDBC kit ensures their director and my friend Wells Wang will be paying me a visit, which helps to level out the pain in my bloody hip, elbow, shoulder and maybe broken bike. Record Scratch. Freeze Frame. You probably wondering how I ended up in this situation...back up 50 minutes. Fast forward 32 minutes. Charlie and I are on the back of the Men's Open Cat 3/4 race of what started with 100 racers. No words exchanged, we just begin moving up. Fast forward 13 minutes. One lap to go. Charlie's 6th wheel, I'm 9th. The contenders are all in the front. I go full suicide, UCLA BBQ fueled, speed demon lead out which has delivered Beards, Baby Faces, Sausages, Head Downs, ShoeBums, Gooches, Roaches, Duncans and Frankels to the podium many times over. Turn 1, Turn 2, Turn 3 and PAYLOAD DEPLOY! The grind of a hill with headwind will blow the top 4 racers out of contention leaving Charlie for his podium. Where is Charlie? The pack is around the corner and Charlie is puttering up the hill, his chain with a bent link, struggling to keep his machine in the race let alone getting to the finish line. Poor guy. That's bike racing. No regrets as we did right. I sit up on my saddle, bringing my hamster heart some relaxation. This is always a welcome calm period after the lead out. There's nothing to be gained by trying to hold on for 30th place, so just take it slow and cool off while looking at the crowd who still have expressions on their face spectating the end of a bike race! Smile about staying upright through a race that had too many, grateful you get to race again in a few hours. The impact that hit me on the left hand side, of a racer who had his head down sprinting up the hill for 60th place, takes me off my bike then bouncing my hip on the asphalt. Instantaneously I'm bloody and bruised and flabbergasted that this happened. My heart rate is close to max, my adrenaline is high, and my verbal filter is off, shouting at the culprit that he is a less than decent individual. Then I collapse and rest for a few minutes while the moto-ref keeps me company waiting for Jeff to scrap me off of his racecourse. The racer turns his bike around, giving up his prized results-sheet line item, and stands by my side until I finally make it to my feet for his idiot-hug. Ricky Bobby: If you ain't first, you're last.Jaycee Carey: You're racing for the top spots or DFL, everything else is reckless and not being a good teammate.Todd Schoenbaum: Podium or GTFO. I'm fine. The San Remo is ~fine. The bike works great. I'll see y'all on the start line of Tour de Murrieta. In the next few days you the LG50 socks will be available. Dear La Grange members, we hope you enjoy this months La Voix. All this year La Grange will be leading "50 for 50 Anniversary Rides." These are 50 "mileish" rides that will celebrate our clubs 50th anniversary, and they are meant to be social rides that crisscross the wonderful city that we live in. These rides occur on the last Saturday of each month throughout 2019. The first ride was lead by Jaycee Cary, who conceived the rides. Here is a video from the ride along with some photos. The February ride will be held on Saturday, February 23rd. Ride details to be announced. The 50th Anniversary Kits are available....again until Sunday, February 10th at 11:59 pm. All members should have received the custom link to the Castelli store. We did make one design update, which was to add the "circle 50" logo to the right glove and to move the logo off the left edge so that the full "circle 50" logo is visible, which you can see in the image below. The original design was intentional and some people liked it and some did not. We do listen to you so if you like the updated design, then order new gloves. Helen's Night is a special night that La Grange takes over Helen's Cycles. Pizza, pasta, salads, beer, beverages and all included but most importantly you get to see your cycling friends and get amazing deals on Cannondale, Giro, Continental, Cycliq, nutrition, and much much more. Please join us. Race Camp was...SMF (so much fun). It's amazing to experience how well so many people get along in one place when they have so much in common. It is also amazing to see how much food a group like that consumes. Friday was a ride up Gibraltar. Saturday was a drills for skills led by La Grange member Marc Thomas followed by a crit, which was followed by beers. Sunday was a group ride with some team racing on certain segments of the ride. The Carlos Soto Memorial Crit - I used to live here and have ridden over 600 laps of this course during summer crit practice, I've never raced here. The Santa Barbara County Road Race was the day before, and I'd ridden 30 miles total in the two weeks leading up to it so I'm still feeling the 60 road race from Saturday in my legs. My plan from the get-go was to throw out attacks consistently throughout the beginning of the race, get the leaders used to seeing me off the front and expecting they can catch me. Looking at the field Serious Cycling and Fig Mtn both have 6+ riders in the pack. I have one teammate who lives up north and I hadn't met until yesterday, Frank and a friendly agreement with Manuel Aguilar AKA BreakAwayManny. It's going to be a tough race. I told Manny before we got started, with 2 to go I'm going to be off. Either off the front or off the back, but I'm going to try to break away, surprise surprise - BreakAwayManny was up for the plan. Started off by taking a solo flyer right out of the gate and leading the first two laps about 50 yards off the pack. Let my legs warm up, said hi to a few of my friends working the race and yelling "I'M WINNING THE RACE" to whoever would listen. After that settled back into the pack. The course is basically a capital D with only two corners. The trick with these is to read the riders in front and control speed so you're not braking and then forced to sprint to stay in the draft. Good to have that jump every now and then but doing it 40 times will get to you. Serious to their credit had some good team tactics going on. If a serious rider was up the road, another would sprint up to 2nd wheel of the chase group, then either gap that wheel or just not pull hard when that rider pulled off. They never got a solid team breakaway going. I made moves off the front a couple times, one bigger one at lap 36 then settled in till lap 26 which came up faster than I realized, went out again and was caught. When the lap cards said 18 I jumped off the front again, I think I was chasing down a rider up ahead I don't remember, but when I was about to let off and drift back the pack I hear "Sam lets go!" from behind me. It was Manny and he had friends. No one had joined me in my other attacks, but now there were 4 of us, me, Manny, Travis from Hit Squad and Madison from Fig Mtn. Finally, I had people to play with! We set up a rotating paceline, each of us taking about 1/4 of a lap then peeling off. The laps that had gone by so quickly before seemed to drag on forever. It wasn't until 10 to go that I felt we had a good chance of making this stick. We had 2 things going for us. Everyone was all in. While some took slightly longer pulls and some shorter we all put in our time at the front and kept the pace up - no one was skipping pulls or too gassed to help out. Madison's Fig Teammates behind us were making any organized chase difficult. With 5 riders the Fig team was in a great position to interrupt any pack organization to chase us down. The laps ticked by and we stayed away. Derin Stockton was on the mic and when he announced we had a 12-second gap on the pack with 6 to go I knew we could make it. To sure things up I announced that I didn't mind taking 4th. I'd never been a part of a break like this before and didn't want it to fall apart until it had too. With 2 to go we started to see the pack ahead of us - unless there was a strong breakaway chasing us we had this in the bag. With 1/2 lap to go I made good on my promise and jumped to the front to take one last big pull through the corner then build up speed for the sprint. It was 200m from corner to finish line and the other 3 guys all came around me before the end. Madison won, Travis 2nd and Manny got 3rd and I took 4th as planned. Best breakaway I've been a part of and a great race. La Grange made a strong showing in the women's P123 race at the season's first CBR event, our backyard crit series in Dominguez Hills. Daniela Garcia finished fourth with support from teammates Catherine Guentert and Danie Monahan in a fast field of 18. After this race, the team talked about the importance of attacking right when it's hurting the worst - because everyone else will be hurting too! CBR1 was also an energizing debut for new-to-LG racers Kim Kopenhaver and Michael Barraclough. Welcome! The annual La Grange club photo will be held Saturday, February 16th at 7:30 am at San Vicente and Ocean Avenue. Members are encouraged to wear their 50th Anniversary Kits. If you have extras, please bring them to the shoot. If you don't have a 50th kit, we want you in the photo but members with the kit will be in the front. The photo is followed by an easy spin around the Marina. Peet's coffee will be served. Happy New Year and Happy 50th Anniversary to Velo Club La Grange! The club was founded by Raymond Fouquet in 1969. Raymond was born December 26, 1920 in a small town that was a suburb of Paris, France. Growing up he loved sport, soccer was one of his favorites; he played in a soccer match on his wedding day. He also embraced bicycle racing and was a keen participant in local events. Raymond continued to pursue his career and worked in some of the area’s top restaurants including Chasen’s and Matteo’s. Raymond and Marie were part of the growing French community in Southern California. They watched as the interest in finer dining, beyond steak and potatoes, grew. In 1968, Ray took the plunge and opened the La Grange Restaurant on Westwood Boulevard. Raymond had always retained his interest in cycling and his waiters would join him on rides. Some customers would join in from time to time as well and that was the genesis of the La Grange Club. Raymond Fouquet, on the far right, founded Velo Club La Grange in 1969. He opened La Grange Restaurant in 1968. Most of you have received the UPS notification that the 50th Anniversary Kits are on their way to you and I'm as excited as you are to receive the kits, which were designed by club members and graphic designers extraordinaire Jaycee Cary and Marco Fabrizio. The Giro Aether MIPS helmet comes in red with a gradient that nicely matches the 50th Anniversary Kit. These are available to club members at an incredible price. Please ask Adam at Helen’s Cycles to order one for you. Helen's Night will be Monday, February 11th at 7:30 p.m. so mark your calendar now. For those that don’t know, Helen’s Night is an annual La Grange event. They close their Santa Monica store and La Grange takes over for one night. Pizza, pasta, beverages of all types plus amazing deals from Cannondale, Giro, Cycliq, and many other vendors plus at least one surprise announcement. You’ve heard of Black Friday? This is Magical Monday! The December Happy Hour was very well attended and quite fun. Thanks to Tracy Paaso and Katie Rollins for their continued organization of these social events. We plan on having four social events during 2019 in addition to Helen's Night so come join your fellow members and try to guess who they are without a helmet. The Giro Aether MIPS helmet was on display, which is why a couple of members are shown modeling the helmet. A fun time at the December Happy Hour was had by all. The brand new 2019 50th Anniversary collector’s edition of the La Grange Membership cards designed by Jaycee Cary are available for members at Helen's in Santa Monica. Ask Mike, Adam, or Sandy when you are at Helen's to give you one. Also, some the Board of Directors occasionally carry extras so please ask one of us if we have one for you. 2019 Membership Card designed by Jaycee Cary featuring the 50th anniversary logo. The La Grange cross team’s inaugural season was a pretty good success if I (one of the captains!) do say so myself. We had terrific participation in all our target races and found team members pinging each other to carpool and cheer each other on for non-target races as well! Duncan Clarke won the men’s C race at Glendale turkey trot cross, arguably the most fun ( and most grassy) course of the year. Cara McCauley Applegate crushed multiple weekends including a second place finish in the women’s masters field at Spooky Cross in Ventura. Sam Selfridge finished the men’s B championship race at Sylmar in a strong 5th place. Dan Funk was second in the men’s masters 55+ race at Sylmar. Jason Kilmer had several strong results including a second place finish in Sylmar for the men’s 35+ C field. Barb Blakley Millott, team co-captain, won 3 masters races and tailgunned in the women’s A field a few times as well. Rod Millott, team co-captain, was a champion team manager, mechanic, and tent setter-upper and far outperformed his wife in captain duties. However, he also pulled down a 4th place finish in Ventura at Spooky Cross in the men’s 45+ B field. 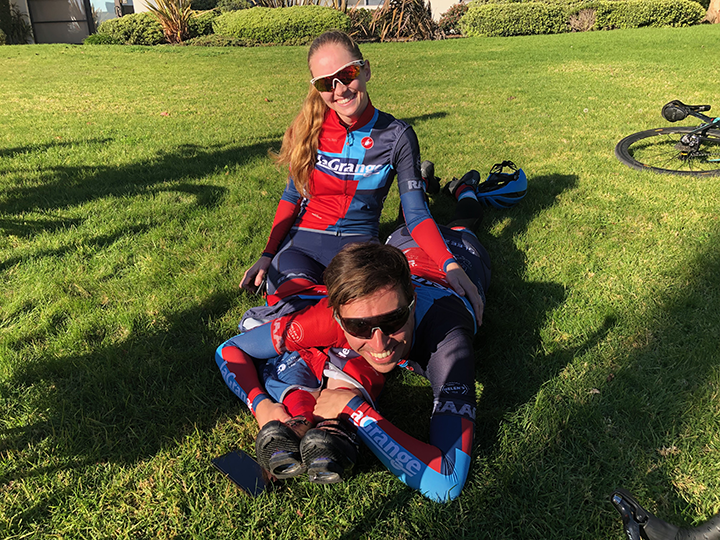 This is by no means an exhaustive list of podiums for the team, but the highlight was getting the team together every weekend for 5 weeks in a row, practicing our skills and our heckling, and enjoying the SoCal weather which is frankly a little too pleasant for cyclocross! Sam Selfridge on the course. Be sure to take a close look at his bike…the front of the bike. Yup. Dan Funk on the podium. Cyclocross co-captain Barb Blakley Millott on the podium. Cyclocross co-captain Rod Millott on the course. Jason Kilmer on the podium. Sophie Millott, team doggie, in her team kit protecting the team tent. Interested in Racing for La Grange?! Any member who wants to race for La Grange should reach out to Robert Efthimos, the Race Director for 2019. Email him at racedirector at lagrange.org for more information...but don't wait since racing starts soon! I want to wish everyone a happy new year and hope you and your family have a very healthy year. And remember, this is your club. We want to hear from you. Our next Board of Directors meeting is Wednesday, January 9th. Graphic created by Robert Franssen. Ivy Koester Competing at 2018 UCI Junior Track World Championships! Guess who is competing at Track Worlds in Switzerland? La Grange Cup TT results and initial overall standings, Drills for Skills, Trackstravoganza , All Clubs BBQ, Race Reports and more! 2018 La Grange Cup Stage 2 - 20K PCH Time Trial - Registration Now Open! Registration for the 20K PCH Time Trial is open NOW to all members! 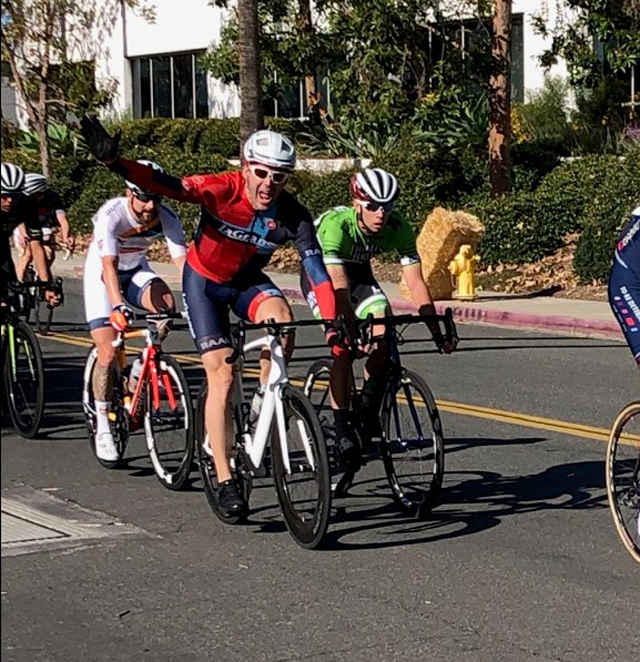 July brings the biggest stage race in the world, lots happening on the track, the 805 Thousand Oaks Grand Prix is coming, more Drills for Skills & a new TriFit on the way! La Grange Wins 10 More Bear Jerseys at SCNCA TTT Championships! 10 more Bear Jerseys for the La Grange Race Team at the 2018 SCNCA TTT Championships! 2018 La Grange Cup Encino 500M Results! La Grange Wins Five Bear Jerseys at SCNCA ITT Championships! Five La Grange racers win Bear Jerseys at the 2018 SCNCA Individual Time Trial State Championships! La Grange Cup begins this weekend, Cycling Savvy and Drills for Skills recaps, a new director, race reports and more! 2018 La Grange Cup Registration Now Open! 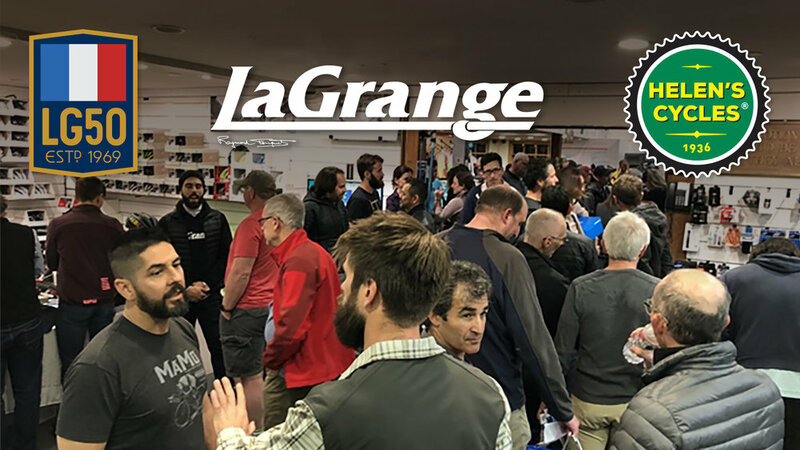 2018 La Grange Cup registration open NOW to all members!